The Herkules 16 Pant is made from a heavy cotton canvas base material (7.7 oz. per yard), coated with a special formulated PVC (10.3 oz. per yard) for a total weight of 18 oz. per yard. The PVC coating is specially designed to resist oils and to maintain flexibility in extremely cold temperatures. Applications: All Commercial Fishing, Building and Road Construction, Timber Harvest, Agriculture, Mining, Shipyards, Forestry, Utilities. 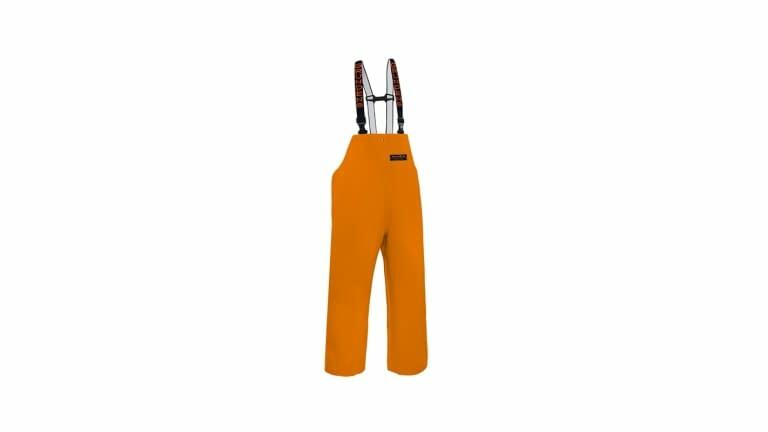 Features: Grundens' heaviest fabric. Side gusset for adjustable width. Fully reversible (front to back) for extended wear. Reinforced hems with riveted seam. Available with speed-clip suspender hook-ups.